once you hit 50 it is and you have errands to run in the morning. For members of the AK club, it's late. I'll explain what AK is to those who don't know. 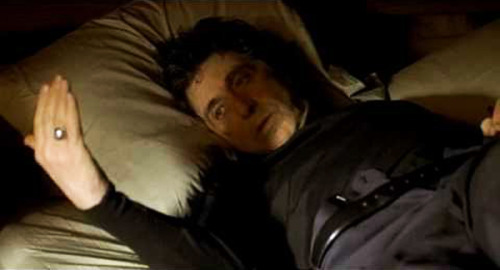 Any movie that manages to combine late-era Pacino AND Williams and gets measured,restrained performances from both? Nope, but I am. 久しぶり Cult. By the way, it is absolutely essential that Girardi not return next year. I heard him refer to the Sheriff as 'Sanchy' in an interview. 'Sanchy'! If they sign Bryce Harper will he be 'Harpy'? If Rusty Kuntz joins the staff will he be 'Kuntzy'? This must not be allowed! Girardi has the laziest nicknames in the world. Good to "see" you, OK! I haven't been around much this season, but with the youth movement and the game on local TV, I wanted to tune in tonight. Picking up sweet tickets to Sunday's game tomorrow morning! I'm good! I've not been here regularly either this year but the Baby Bombers got me back. Enjoy the game tomorrow! Weaver throwing fat pitches like I do to my son for batting practice..
Tananka pitching a gem on my birthday. Sanchez continues to crush. Woke up to a cool hand-made card from my daughter. What could be better? Until Binder Joe [gasp]...but it worked out. Oh, god please. You didn't. Kirby Yates. rbj - I'm not that far off and have to get up in the mornings to get my daughter to school, but midnight is noon to me and I work nights! I'm shocked the bullpen preserved the shutout! Can't wait to watch the highlights of Sanchize stealing a base! Whew. Can Tanaka get 13 wins? Hope so. Torreyes hits his first homer ever in the bigs. Listening to Suzyn's postgame, first Didi picks him up and delivers him to the interview, then comes back and pours a bucket of bubble gum on his head. Moments later, Dellin pours water on his head. It's not the first time he's been picked up and carried around like a kid's teddy bear. Yet, even though I only caught the tail end of the game and listened to the postgame interviews and recap, I feel good for this kid, and I feel something that has been missing from this club for at least the past two seasons, maybe more. Suddenly the losing isn't such a bad thing, because the young guys seem like they're picking up all this big league stuff really quickly. Hell, they may be a .500 team, but right now they aren't a mediocre .500 team. I did catch a little of the end of the game -- not up late, but waking up early, in England. So I missed some homers but did get to see Tanaka and then the handoff to the bullpen. Boy, I really like Gary Sanchez. I'm slightly resentful that we were deprived of a few months of him. Why? Austin Romine? Really? Top o' the mornin' to ya, matey! We're in a yurt at a Georgia state park for me wife's early birthday present. Yeah, Gary is awesome. Can't wait to see his stolen base! Thanks for the birthday wishes guys. I feel the love. Hhe Ellsburys it. Everything's Jake with Jackoby. Torreyes is teriffic. Bonny Ronny. Yes in DiDi, Gregorious makes Yankee fans euphorios. Boat. Judge should be "here comes the judge" or "judgement has been rendered." And Hicks? Pick up sticks? Aaron Abomb? Aaron makes like Henry?